20th century, when the commercial internet was in its infancy, there was no end to the griping about “silos.” Back then silos referred to That Which Is Digital and That Which Is Not Digital. The gripe (from the digital side of the equation) was that the not-digital team got all the budget, and didn’t even accord the digitals a place at the table. So ingrained was the silo grudge that no one, but no one, grew to understand silos better than the digitals. In a scant decade, more digital silos emerged than you can shake a stick at: Search. Email. Display. Social. Analytics. Online video. CGM. CRM. Targeting. Retargeting. The list goes on. Digital is, after all, highly technological and all these areas legitimately require high degrees of specialization. They still do, but now there’s a very compelling reason for digital to stop the Balkanization it so actively criticized just a few short years ago. The reason? Media are converging. The new research report I publish today, together with co-author Jeremiah Owyang (we were ably assisted by Jessica Groopman and Chris Silva) reveals that consumers, who flit like so many butterflys between devices, screens, windows and channels, are making little distinction between media types. Paid, owned, and earned media? It’s rapidly becoming all just…media. Ads, blog post, social interactions – either they’re interesting (or entertaining, or engaging, or helpful, etc. ), or they’re not. Brands must integrate paid, owned and earned channels now. It will not only make marketing more effective and efficient, but it will prepare them for the future. As traditional media becomes increasingly digital, this trends is beginning to occur offline, too. Converged media is tough to wrap your arms around. Paid must inform owned which must inform earned, and vice versa, and sideways, too. It’s complicated, but it can pay off in much-improved optimization, reach, insights and above all, effectiveness. We like to think of it as a stool. Three legs (paid, owned and earned) provide a better foundation than one or two would. To effectively commingle paid, owned and earned media, brands must get everyone around the table and make them play nice together – easier said than done. Ecosystem players such as software vendors and agencies have areas of specialization – not to mention revenue models – that rarely scope beyond one of these three channels. Yet effectively converging media brings with it an advantage beyond more effective advertising and marketing. Integrating teams, both internally and externally, will help smash the multitude of silos that litter the digital landscape. Converged media is both a reality and an opportunity for better integration and collaboration across a myriad of digital specializations. Imagine the possibilities when we all start really collaborating with each other! 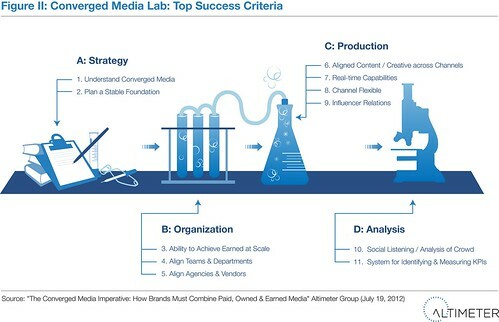 As with our other reports, The Converged Media Imperative is published under the Open Research model. Use it. Share it. And we’ll publish more.